For a quick, easy and totally delicious meal, it doesn’t get much better than these three-ingredient enchiladas. Leftover roast chicken is transformed into something a whole lot more exciting with the aid of corn tortillas and store-bought enchilada sauce. 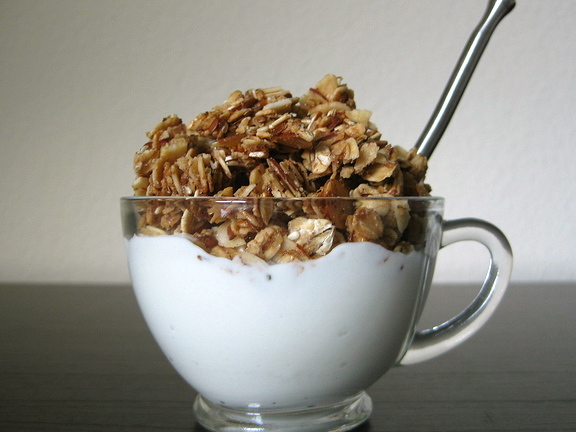 From there, you can get as creative as you like! 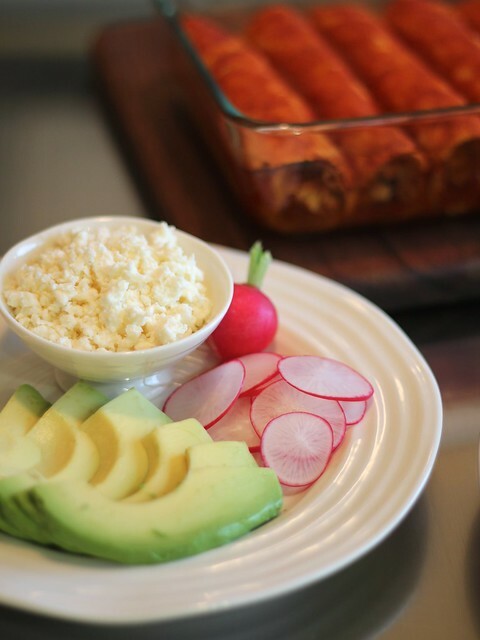 I’m partial to serving these rollups topped with a sprinkle of salty crumbled Cotija plus creamy avocado slices and crisp radish along side, but keeping things a little more simple with a layer of molten cheddar is certainly another tasty way to go! 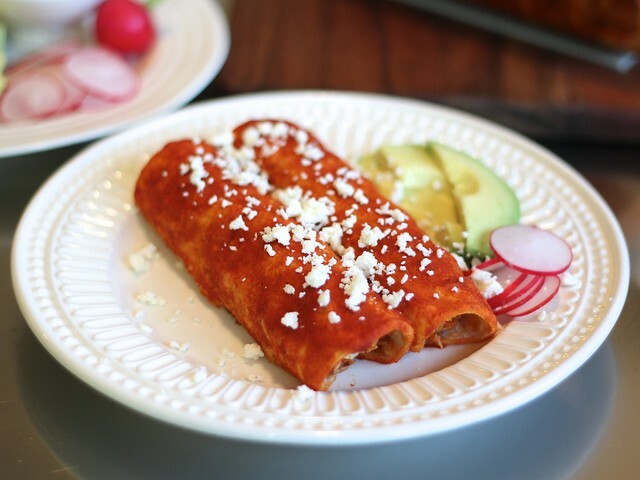 What’s your favorite enchilada combo? Are you team red sauce or green sauce? Let’s talk in the comments or on Facebook or Twitter! Tightly wrap the stack of 8 tortillas with aluminum foil, place on the center rack of the oven and turn on to 400°F (they’ll be softened and hot once the filling is prepped, about 10 minutes). While tortillas soften up and oven preheats, prep filling. Cut chicken into 1/4″ – 1/2″ slices against the grain. Cut each slice into rough cubes and transfer to a large bowl (you’ll have about 3 cups chopped chicken). Add 1 packet enchilada sauce to the chicken, and stir well to distribute evenly. Open the second packet of sauce and spread a few tablespoons (up to 1/4 cup) sauce in the bottom of an ovenproof baking dish (8″x8″ or 7″x11″ are two good sizes); set aside. Remove softened tortillas from oven. Scoop 2.5 ounces (about 1/4 cup, lightly packed) of the chicken mixture onto a tortilla. 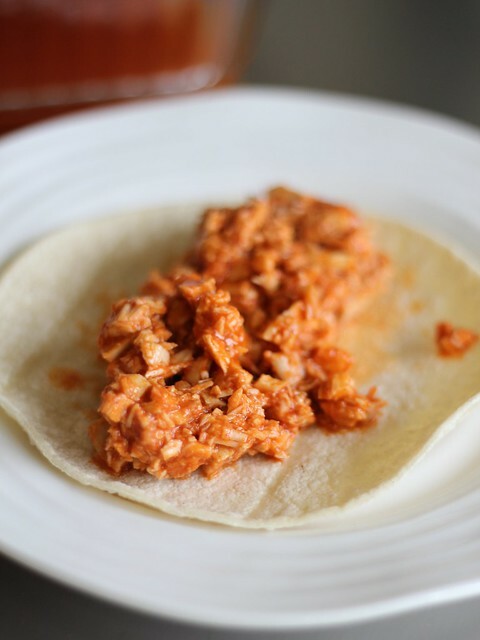 Arrange chicken in a line down the center, fold one side of the tortilla over top then tuck it under the chicken filling and roll tightly. Set in prepared baking dish, seam side down. Repeat with remaining filling and tortillas, tightly packing into the baking dish. Pour remaining enchilada sauce over top. If desired, sprinkle with shredded cheddar. 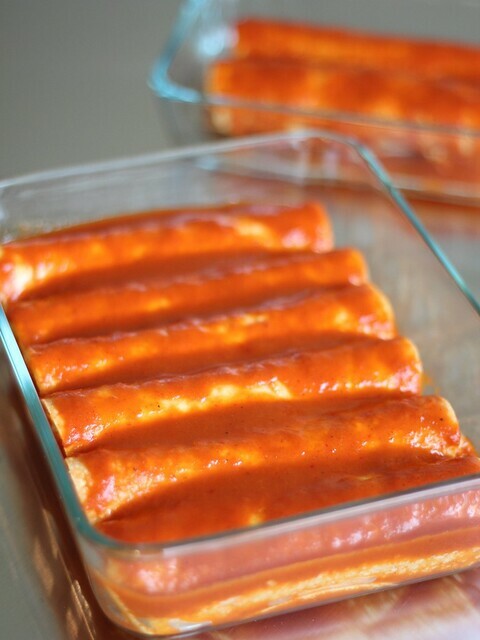 Place baking dish in preheated oven, and bake — uncovered — for 15 – 20 minutes or until filling is piping hot (I do recommend loosely covering non-cheese-topped enchiladas with a sheet of foil about half way through to prevent them from over browning or drying out). 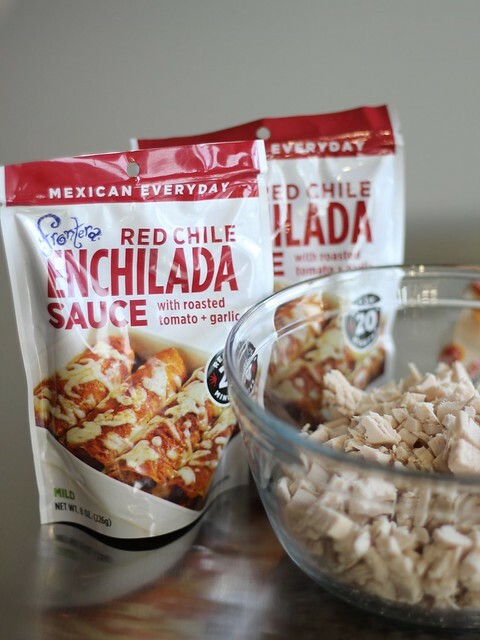 Remove from oven and serve immediately &mash; it may be a challenge to remove enchiladas neatly, but even if they end up looking a mess they’re no less delish! ¹ This mild red sauce can be purchased online or at your local Target or Whole Foods.